Next postBlog Awards & Nominations! I like the idea of our soul having a “call button” that taps right into God and His indwelling Holy Spirit. When things get chaotic, I often forget that I have all that I need. Yes, instead of reaching for the chips or the credit card I need to reach for His Word. Continually being in His word (on good days and bad days) helps me fend off and be better prepared for when the chaos hits (and it surely will). Great post! Hi again Bev! So glad to “see” you here! Love your comment, as it reminds me of where I need to stay today! Blessings back atcha! Thanks for these timely reminders, Allison! We’re in the back-to-school whirlwind, and the reminder to remain anchored in Christ was just what I needed this morning! Hey again Stacey! Having such fun getting to know you through our blogs! Yes, the BTS whirlwind is gobbling me up even as I type. “Christ, please center me.” is on replay in my head these days. Best wishes as you brave the crazy too! Blessings! I needed to read this. It has been so hetic lately. That this was right on time! Thanks for stopping by today and welcome! Yes, hectic is our new normal this time of year. Prayers and blessings! if it were not for Jesus in the midst of my storms, the winds would have overcome me a long time ago. For sure! I’m clinging to Christ’s blowing cloak now! Blessings! What a great reminder and encouraging word, Allison. Thank you for waiting on Christ’s word; His is ALWAYS right and ALWAYS on time if we will yet be patient, hearing His message for us. You hit home on this one for me, Allison. Thank you! Hi Carol! So excited you stopped by to visit! Your steadfast faith inspires me! Yes to all you said! Prayers to you and yours as Irma approaches! Great post, Allison! I’ve actually wondered if everything was ok as I hadn’t seen anything from you in a while! I should have checked in! Thank-you for sharing your heart and beautiful message! Hey Lindsey! So glad you stopped by again! Aw, thanks for thinking of me during my blogging break. It was a rough month, but a great reminder of why I blog: for Christ and Him alone! Hope all is well in your world in this busy season! 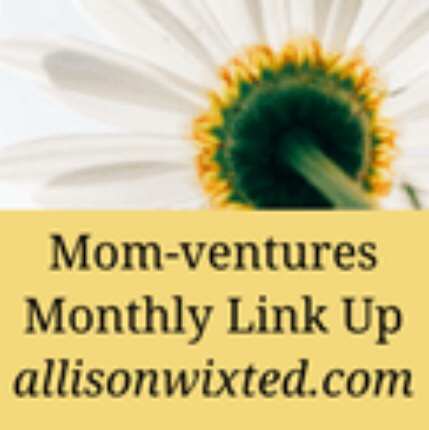 Be sure to link up one of your posts this month too! Your writing is beautiful! God is SO much greater than any darkness or chaos we could ever encounter, even the destruction from Hurricane Harvey. Thank you for this reminder! Hi Sydney and thanks for visiting! Welcome! So glad God touched you through this post. So true! Blessings to you and yours! This has been my life the past month. We’ve just put out a new book and it’s been a lot of work! But I’m grateful now for time to breathe, for seeing how God is working, and for the opportunity to get to share hope with others. I struggle with finding that contentment in the storm, though…a work-in-progress! Hi Rebekah! Thanks for visiting today! Yes, me too! So hard to pause for peace when chaos clings to us! Congrats on your book!!! Tell me more and big blessings on it! Hey Allison! The book is called Hope for the Hurting Wife, and it comes out of one of the darkest times in my life, when I wasn’t sure if my marriage would survive – or even if it should survive. God brought another friend into my life who had struggled in her marriage. She was a strong friend for me, and over time, God led us to write this together, out of the experiences we’ve had. The book launched on Tuesday and we’ve already had an overwhelming response as only God can orchestrate! We’re praying it continues to reach the women who God has planned it for. It’s a redemption story – redemption of marriage and faith. It’s not a promise that God will redeem anyone else’s marriage, because we can’t know that. But it’s hope for women who walk the dark road of marriage struggles and crisis. So exciting Rebekah! Congrats again – not only on your book but surviving such a dark time! Surviving the darkness is the greatest victory of all and credit to our Creator! Life is crazy; seek Jesus! Blessings! Handing over our pain, frustration and fears to Jesus releases His peace in us. I know because I did this on Sunday during worship. Hi Helena! Amen, sister! Hope you’re resting comfortably in His arms as I type! Thanks so much for visiting and blessings to you! Allison, so wonderful that you were able to share two great resources in one blog post! Sharing a post in the link up, and glad to find your writing home via the Fierce Hearted Launch FB page! Hi Michele! Glad you enjoyed hearing about both books in one post! I wasn’t quite sure if that was faux pas or not? Thanks so much for visiting and for linking up! Headed to your blog now! Yay for #fiercehearted Friends! Hey there, Allison! I’m so glad we are neighbors.. I clicked on over and there are just so many things I love about this post! I’m on Holley’s launch team and cannot wait to get my hands and my heart around Fierce-hearted! It’s going to be amazing! Also – we just went through the hardest, darkest Summer and this truth of choosing Love and of clinging to Him in the midst of chaos is a lesson learned and fought for in our own lives, too! So good and vital and full of Truth and Hope! Hi Karrilee! So glad to “meet” you too through the #fiercehearted launch team! And so glad you stopped by to visit today! Glad this little post resonated with you! It sounds like we have both survived challenging summers! Blessings! Great article .thanks for giving us a opportunity to win. Thanks, Noelle! So glad you stopped by today! Blessings! Leaving you a comment for your give away. Thank you, what a nice thing to do. I lived the back to school chaos for 30 years as a school administrator! This was my first “not back to school” and I found some joy in it (I got a pedicure on the day school started and went out to lunch — it was totally weird!). I came to your blog off another new start up blog link. I’ve been praying about whether to start a blog, I have a few life stories. More recently God has been dropping a few writing pieces in my heart and I’ve been sharing them on Facebook. Now I’ll click your link thru to God’s storytellers. Thank you. Hi Verna! Wishing you luck in the giveaway drawing! So exciting that you’re considering launching a blog! It is so much fun – connecting with others and sharing God’s Word! Sending you prayers that you will bless others in God’s name, regardless of your next steps! You’ve already blessed me by stopping by today!